Graffiti Restaurant opened over 20 years ago in the small fishing village of Destin, FL. As the city grew in popularity, so did Graffiti and its need to expand. The next natural step was to add The Funky Blues Shack, a live music venue, winner of Best Music Venue 3 years in a row! Our family-friendly restaurant is as impressive as the décor itself! We believe in enriching the senses from the moment you walk in. Everyone is made to feel welcome and the first thing you will notice upon entering is the fun and quirky atmosphere. Much of the art that surrounds you has been custom made for us by local and well-known folk artists. We pride ourselves in making our food from scratch, using only the freshest ingredients available, not to mention our Fresh Gulf Caught fish! At Graffiti, we love creativity and encourage it all the way from the kitchen to the customer (we love it when you leave us a new menu cover!). Our menu is sure to satisfy all in your group, from ages 1-99! From the Vegetarian to the Meat eaters! We showcase a range of everything from pizzas to filets. Some of our dishes have been tried and true, The Fried Green Tomatoes, topped with Jumbo Lump Crab Meat and Crawfish, then finished with a Spicy Cream Sauce has proven time and time again to be a customer favorite. 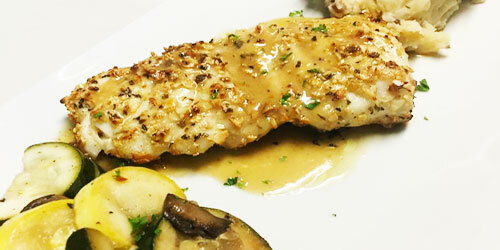 Our Roasted Almond crusted Fresh Gulf Red Grouper finished with a Hazelnut Butter Sauce has been on our menu since we opened 21 years ago, that’s how good it is! Our Sautéed Shrimp served over Smoked Gouda Cheese Grits with a Portabella, Corn, & Scallion Ragu will leave you coming back for more. We offer Gourmet Pizzas such as the “Michael Jackson”, we start off with our own Hand-Tossed Pizza Dough, next, add our Homemade Alfredo Sauce, then top with Spinach, Artichokes, Black Olives, Sun-dried Tomatoes, and finish with Mozzarella, Parmesan, and Goat Cheese -Perfection! 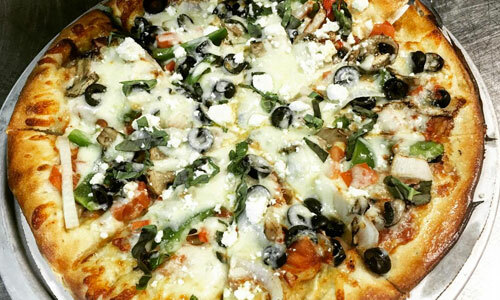 For the more adventurous kind, we offer a Create Your Own Pizza section. Don’t forget to try some of our new menu items as well. We’ve expanded our menu to feature more Gourmet Salads, such as our Kale, Red Onions, Avocado, Garbanzo Beans, Tangerine, and Shaved Parmesan Salad, tossed in our Homemade Honey Roasted Sesame Vinaigrette. We provide the highest quality of food and expect the highest level of service from our employees, so get ready to be impressed! After 21 yrs, our popular dishes reflect the tastes and likes of our loyal customers and tourists! Graffiti and The Funky Blues Shack are available for private parties and catering. Enjoy a private five-course spread or a meeting space with full audio/video capabilities. Our knowledgeable staff and atmosphere provide you with an impressive backdrop to showcase your private function or event. We bring you the best of the Emerald Coast! © 2019 Graffiti & The Funky Blues Shack | All rights reserved.